We believe giving our time, money, and talent can make a long-lasting positive impact on our community. Calgon Carbon believes in enriching the communities where we live and work. We do this in a number of ways through volunteerism, fundraising initiatives, and by encouraging our neighbors to live healthier, better-educated lifestyles through our support of community programs and partnerships. Through our corporate charitable contributions and community relations efforts, we support organizations related to education, environmental development, health, and community-based initiatives. For information about qualifying for charitable giving funds or to submit a request, contact CBostardi@CalgonCarbon.com. 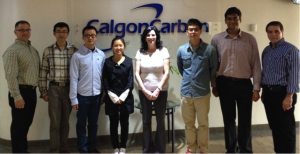 Calgon Carbon Corporation and Carnegie Mellon University recently completed a joint project as part of a graduate level Sustainable Engineering Course. The goal of the project was to analyze EPA data in regards to remediation technologies. The team analyzed the information of the National Priority List (NPL) sites, and aggregated the data based on primary program areas. The analysis will help Calgon Carbon direct resources and technologies in support of the cleanup of contaminated sites throughout the United States.